Lori Johnson is with her monkey, Jessy, all the time. When she was a baby, Jessy latched onto Lori's arm 24 hours a day for six months. Jesus and Carmen waited seven years, until they were financially stable, to adopt a newborn. But the Indiana couple didn't adopt a human baby. They adopted a baby monkey. "She's pretty much our entire lives, actually," Jesus said of baby "Butters." Monkey business is big business in the United States, where some people pay up to $5,000 to adopt a monkey of their own, often a capuchin monkey, which can grow up to 22 inches and 9 pounds. There are hundreds of videos on the Internet of proud parents enjoying their monkeys, and an estimated 15,000 monkeys live with humans as pets or surrogate children in the United States. And in some cases, monkey babies are more than pets: They are sons and daughters. These families dress their monkeys, feed them at the dinner table and treat them like any other member of the family. A number of couples who have adopted monkey babies, sometimes referred to as "monkids," are the subject of the documentary "My Monkey Baby," airing this weekend on TLC. Watch "My Monkey Baby" Sunday, Oct. 4 at 9 p.m. on TLC. Jesus and Carmen decided not to have children because of Jesus' own difficult childhood. But they are devoted parents to Butters. Carmen crocheted clothes in anticipation of her daughter's arrival, and dotes on her "baby girl," who wears diapers sized for premature infants. "She is gorgeous," Jesus said in "My Monkey Baby." "Hi, little girl." "Look at those big pretty eyes," Carmen gushed. "Yeah, those pretty eyes." Jesus and Carmen take Butters in a baby carrier when they leave home. "We carry her in a little baby pen, so it draws less attention," Jesus said. "We haven't had a single place yet ask us not to bring her in or anything. Typically, we end up having all the workers around taking pictures." Like any cute baby, Butters draws oohs and aahs from onlookers. And, as with any baby, she can be quite demanding. "We've got 24-hour-a-day supervision with her," Jesus said. "Me and Carmen have already worked our work schedules so one of us is either always here or we got the babysitter here for her." Bob and Mary Lynn, who live in Tennessee, have two monkeys in the family. The couple decided to adopt the first a few years ago after learning that Mary Lynn could not bear children of her own. Mary Lynn calls herself a stay-at-home mom to Maggie and Silly Willy and, she said in the documentary, "our lifestyle seems to fit really good with the monkeys." Like any parent, she's always chasing after her charges and she often has to remind Silly Willy that "mommy is the boss," especially when he doesn't want to get dressed. "If we get in the car and you're too warm, I will take it off but, for right now, it has to be on," she told him. Monkids are often adopted by empty-nesters looking to relive all the fun of raising children without reliving the most turbulent years. Missouri retirees Lori and Jim Johnson adore their monkey, Jessica Marie. Lori adopted "Jessy" when she was 7 weeks old, before she and Jim were married. The couple were featured in a July 2008 ABC News "Primetime" report on monkids. "I thought about babies, but I didn't want to go through the preteens all again," Lori told "Primetime," explaining that she fell into a deep depression and ended up in the hospital after her youngest child moved out of the house. "I wanted a monkey because it's not going to grow up [like human babies]." This led her to another solution, and to Jessy. "She thinks she's a child. She doesn't like other monkeys at all," Lori said. "She'd rather play with the kids." Jessy is with Lori all the time. When she was a baby, she latched onto Lori's arm 24 hours a day for six months. "Six months that I showered, went to the stores, cooked, slept, everything with her on my arm, because she wouldn't get off," Lori said. "You couldn't get her off." It was nine months before Lori could leave the room without Jessy having a panic attack. There were other difficulties, as when Jessy started to nip at Lori and her husband, Jim. They eventually had her teeth removed. Although there have been challenges, Lori said she couldn't imagine life without Jessy. "I couldn't imagine not having her," Lori said. "We do something all the time with her." Jessy gets dressed up in an assortment of handmade dresses, goes everywhere with Lori and Jim, sleeps in the same bed as they do and loves fast food. Her favorites are Slim Jim meat snacks and "monkey" fries. "If I hear somebody call her a monkey, I throw a fit. She is my daughter, 100 percent," Jim said. Lori said, "It's a deep devoted love on both sides, they put their arm around your neck and they give you kisses. And they talk to you, and you know that they care. You know that they love you, there's no doubt." Unfortunately, not all stories end so happily. Angelle Sampey had always wanted a monkey since holding her first baby monkey at a petting zoo as a child. Several years ago, single and with a career in Louisiana as a motorcycle drag racer taking off, Sampey thought adopting a monkid could fill the void. "I can't race and, you know, bear a child. And, I thought, you know, adopting a monkey as a surrogate child would be a good thing to do," Sampey told "Primetime" in 2008. 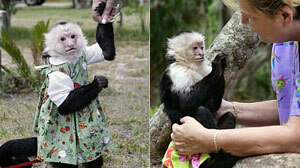 Sampey found her capuchin on the Internet and bought him from a breeder in the Midwest. She picked up her "son," Andy, at the airport. "I was so happy. I had a baby," Sampey said. "I could dress him, put a diaper on him and he would drink [from] bottles." Like Jessy, Andy also latched onto his new mother for six months. "But to me, that was cute. He loves me. I didn't see it as this animal needs his mother," Sampey said. Everything seemed right in the beginning, and Sampey spent thousands of dollars building a special room for Andy in her home. But Sampey's joy became an emotional nightmare when she found out how monkeys are sometimes taken from their mothers. Sampey learned after she bought Andy that monkey mothers are routinely darted with sedatives so the babies can be removed. "Can you imagine taking a baby from a mother out of the hospital? And that's what we did," Sampey said. "He is a wild monkey. He is never going to be domesticated, and it took me seven years to realize that." During those seven years, Andy tore down the walls and curtains and ripped out the wiring in the special room Sampey had built for him. Sampey knew Andy was lonely and depressed. When Andy thought Sampey had come to take away the peanuts she'd given him, Andy attacked her, biting her repeatedly. That night, Sampey searched online and found Kari Bagnall, who runs the Jungle Friends Primate Sanctuary in Florida. Jungle Friends is home to more than 100 monkeys, many of whom were surrogate children whose "parents" could no longer care for them. "I have monkeys here that the people have had for 20 years. Never had a problem," Bagnall said. "Twenty years later, the monkey attacks. So it's just something, it's going to happen. It's not a matter of, you know, if they're going to attack. It's when." After arriving at the sanctuary, there are extraordinary challenges for the monkeys. In many cases, their teeth have been pulled out and their fingers cut off. "The breeders tell you, 'Oh, it's just like having a baby ... you get to bottle feed them and they can stay on the bottle forever,'" Bagnall said. "It's just crazy." There are dozens of other monkeys on the waiting list for Jungle Friends. Sampey, who once spent thousands on her monkid Andy, is now contributing thousands to Jungle Friends, the new home of her son. "He's going to live in our hearts now, not our home," Sampey said. For more information about Jungle Friends Sanctuary please CLICK HERE.